And there it was, shown in Figure 1. Busy. Crowded. Lots of books. Just like bookstores from the 1990s, yet something seemed off about it. Figure 1. 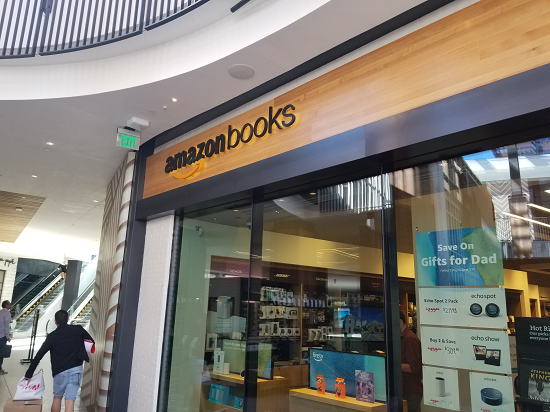 The brick-and-mortar version of Amazon’s bookstore. I’ve been to a lot of bookstores. The atmosphere is charming. They’re familiar, comfortable places. Yet, the Amazon bookstore wasn’t the same. Yes, it had stacks of books. Yes, they sold other items in addition to books. Yes, people milled about, picking up books, talking with their friends, and enjoying themselves. But overall, the store had a sense of artificiality. For example, the selection was thin. It was bestsellers and current titles only. The Fiction stacks were practically non-existent. I remember being in huge bookstores back in the 1990s and early 2000s. They had thousands and thousands of books, all sorts of titles. This store was just a peek into what’s available. Knowledgeable salespeople were missing. Normally a bookstore is chock full of people with keen recommendations and suggestions. Amazon has instead stocked its store with electronics. They may offer a suggestion or lead you to the website where you can find the book you want. And the shelves were organized like the website, as shown in Figure 2. Figure 2. Does this display look similar to things you’ve seen online? After browsing the store — and I did enjoy it for being the only bookstore I’ve seen in years — I went on a hunt. To my surprise, the bookstore lacked any For Dummies titles. Not just my own, but any For Dummies title. In fact, the “self-help” section was threadbare. The store had no religious texts, no philosophical texts, no references, no foreign language books. After the initial thrill wore off, I recognized the store for what it was: A shell of place, resembling something I knew well but a poorly-constructed imitation. It was grocery store sushi. It was an airplane snack. I understand the Amazon Store’s purpose: Marketing. The store doesn’t exist to move books or it would have been packed with titles. It was there to promote the Amazon brand. My son purchased a book. He didn’t use cash or a credit card. Instead, he scanned a barcode with his phone’s amazon app. Tap, swipe, and presto! He was done, bought and paid for the book with his Amazon Prime discount. “Would you like a bag?” the clerk asked. I’m surprised they didn’t put the book in a UPS box with air pillows. 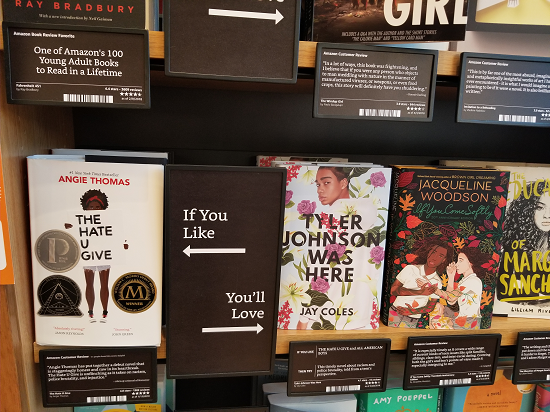 If the Amazon bookstore showed me one thing, I was how much I miss the old bookstores. I’m now curious how a real bookstore would do in a mall.